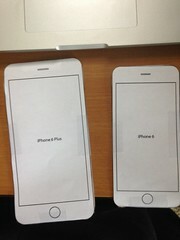 I printed out this iPhone 6 and 6 Plus paper template. I cut out each template and taped cardboard to the back. Then I did a pocket test with each one. I tested each template with different pants and shorts that I wear often. I found that both the iPhone 6 and iPhone 6 Plus fit in all my pockets, but a corner of the iPhone 6 Plus cutout does stick out of the pocket on my gym shorts. I also found that while the iPhone 6 Plus does fit in the pockets of my Levis 501, my jeans of choice, the cutout was annoyingly noticeable when I sat down. For those wondering, I’m 5 foot 6 and typically wear 32 inch waist pants and shorts. Taller folks with roomier pants and shorts might not notice the size difference of the Plus as much as I did. As for holding the two cutouts, I found that the iPhone 6 cutout fits comfortably and securely in my hand. The iPhone 6 Plus cutout, on the other hand, just feels too big to hold and use with one hand. Granted I have small hands, but in acting like I’m interacting with a real iPhone I found I kept using two hands with the iPhone 6 Plus whereas I was comfortable using only one hand with the iPhone 6 cutout. Conclusion: I will be buying the iPhone 6. The larger display of the iPhone 6 Plus would be nice for reading and watching shows and movies, but it’s just too damn large to be pocket device for me. Posted in programming. Tagged in ios.